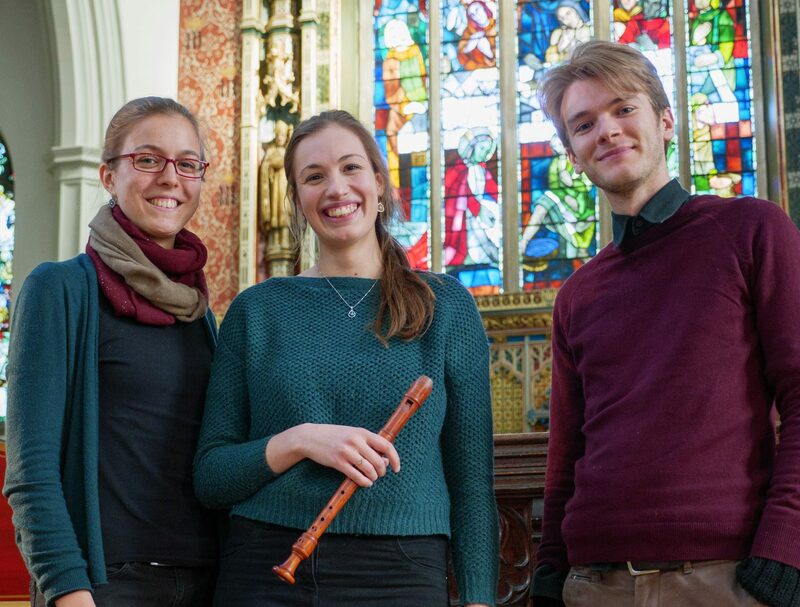 Recorder player Olwen Foulkes, center, with colleagues Tabea Debus and Nathaniel Mander. All of the composers on this disc were part of Handel’s career in London, either playing in his opera orchestra or popular with audiences and amateur musicians. That broad connection results in an imaginative program including elegant dances by Corelli, Handel’s well-known lyrical grandeur, brief works from the rarely-heard Roman virtuoso-composer Castrucci, expansive theme and variations, folksy English airs, and more. Recorder player Olwen Foulkes has assembled a real Baroque grab bag packed with plenty of technical and expressive possibilities. Listeners might not even notice that, apart from two pieces, none of the music on this disc was actually intended for her instrument. 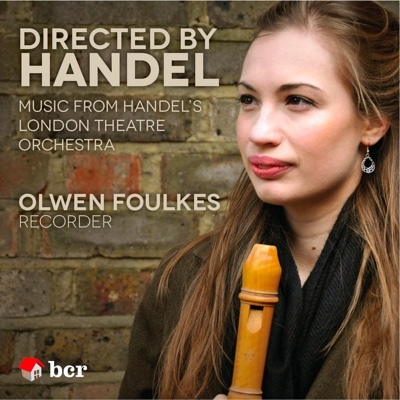 Foulkes’ liner notes explain that transcriptions for recorder were incredibly popular in London and in turn inspired her material on this album. The upper register writing in Corelli’s Sonata in C for violin (Op. 5, No. 10) now chimes as well as soars in Foulkes’ arrangement and playing. The Sarabande becomes a softly exhaling, hypnotic 18th-century gymnopédie. Sammartini composed his Sonata in G Minor (Op. 13, No. 5) to be played on transverse flute, violin or oboe, apparently never envisioning a recorder. Yet the melancholy first movement sounds perfectly natural in Foulkes’ hands. Her phrasing also gives the knotty arpeggios of the Presto a more incisive feel. The sustained notes in Castrucci’s Sonata in A for violin (Op. 1, No. 6) were intended to show off string sound, but here they refract the range of colors in Foulkes’ tone. Recorders are synonymous with high pitches, so it is also refreshing to hear such a rich, fulsome middle register in Foulkes’ arrangement of the Ciaccona from Castrucci’s Op. 2. Foulkes’ transcription of a harpsichord air by Handel’s amanuensis John Christopher Smith (Op. 1, No. 6, which itself originally borrowed from Handel’s recorder works) starts out peaceful, at times even gloomy, then gradually splinters into runs and Foulkes building in intensity as well as dynamics before a finger-busting final variation. Foulkes also switches up the continuo instrumentation on each work and sometimes between movements to add even further variety to this recital. Cellist Carina Drury and harpsichordist Nathaniel Mander display a real give and take in the Corelli sonata, slightly varying their balance and leaning into Corelli’s Gavotte for a thoroughly dancing account. It’s just Mander with Foulkes for Handel’s Sonata in F (Op. 1, No. 11), and they achieve a transparent, light mix that sacrifices none of Handel’s theatricality. Toby Carr’s lone theorbo accompanies Foulkes on the Castrucci, giving it a pastoral feel and allowing some playful exchanges between lead and accompaniment. 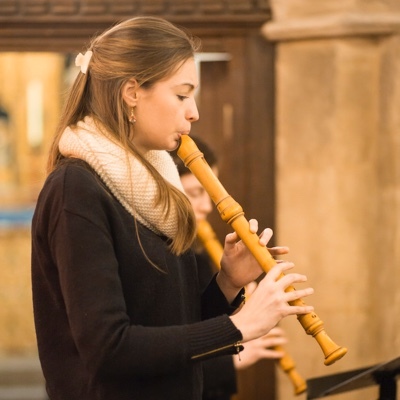 Tabea Debus’ bass recorder is a downright ingenious touch on the Sammartini piece, at times sounding like organ stops grafted onto the harpsichord. Handel’s only work for unaccompanied violin unfolds like an extended recorder cadenza to introduce Foulkes’ suite arrangement of arias from Handel’s Il Pastor Fido. With cello and theorbo alongside Foulkes, “Non vo’mai seguitar” gets a little 18th-century swing. The Sonata in F for cello by Geminiani (H. 107) and John Blow’s “Morlake” ground bass variations for harpsichord spotlight Drury and Mander, adding even more surprises to this program. Close, crisp acoustics and engineering at St. Michael’s Church in London capture Foulkes’ every breath, which some listeners may find distracting. This writer found it made the effort and thought involved in this enterprise all the more palpable. In just over an hour, Foulkes and her colleagues take both the late Baroque and the recorder repertoire on quite a ride. The anonymously composed “Divisions On A Ground” for recorder ends the disc in a calmer, reflective mood, though not without a few shredding moments. 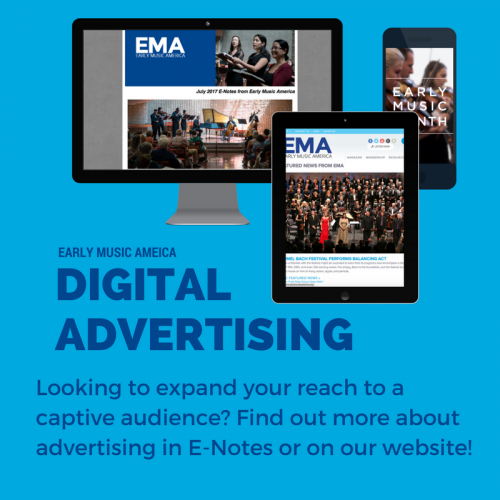 Andrew J. Sammut has written about early music and jazz for Early Music America, The Boston Musical Intelligencer, All About Jazz and his own blog. He lives in Cambridge, MA.